Dave Liddell spent nine seasons in professional baseball, but his major league career lasted for just one at-bat and one half-inning in the field. The Chicago Cubs selected Liddell in the fourth round of the 1984 June Amateur Draft, but two years later they traded him to the New York Mets organization in a deal for pitcher Ed Lynch. 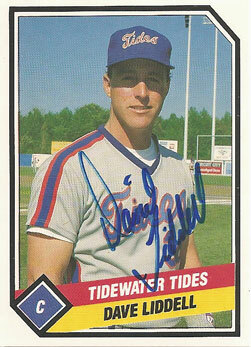 Liddell reached the Major Leagues with the Mets in 1990 and played in his only major league game on June 3. Trailing the Phillies 8-1 in the eighth inning, manager Buddy Harrelson sent Liddell up to bat for Mackey Sasser against lefty Pat Combs. Liddell singled up the middle to start the inning, and advanced to second when Combs walked shortstop Kevin Elster. Right fielder Mark Carreon hit a flyball to right field, and Liddell advanced to third base. With third baseman Howard Johnson at the plate, Liddell scored on a wild pitch. The Mets scored one more run, but couldn’t get back into the game. Liddell caught Julio Machado in the bottom of the eighth inning, then never appeared in the major leagues again. He left minor league baseball after the 1992 season. Trivia note: Liddell is one of five players with a perfect 1.000 batting average for his Mets career. The others are Ray Searage (1981), Rodney McCray (1992), Eric Cammack (2000) and Gary Bennett (2001). Cammack, like Liddell, has a perfect 1-for-1 career batting average. Searage had a 1-0 record with the Mets, so he also has a perfect winning percentage with them. I purchased this card for $1 from a dealer at a sports autograph show in 2012.